In a disaster, local officials and first responders cannot reach everyone immediately. Help may not arrive for hours or days. You and members of your community need to be prepared ahead of time. Most disasters are natural disasters, the result of some force of nature, such as tornadoes, wildfires, hurricanes, and floods. Some natural disasters can be predicted, such as hurricanes and severe winter storms, while others, such as tornadoes and earthquakes, happen with little or no warning. Some disasters are the cause of human actions, intentional or unintentional. A disaster plan will help with safety, security, and comfort. Regardless of the type of disaster, there are things you can do to prepare. Discuss what to do in an evacuation, and don't forget to include the needs of those with disabilities. When told by officials, go immediately to a shelter as instructed or to the home of a friend or relative who lives out of the area. Find out about your local shelters beforehand. Know evacuation routes. Pre-establish several different routes in case certain roads are blocked or closed. Family members can become separated during an emergency. Be prepared by creating a plan for how to reach one another. Establish an out-of-area contact (such as a relative or friend) who can coordinate family members' locations and information should you become separated. Make sure children learn the phone numbers and addresses, and know the emergency plans. Quiz children every six months so they remember what to do, where to go, and whom to call in an emergency. Decide how to take care of pets. Pets are not allowed in places where food is served, so you will need to have a place to take your pets if you have to go to a shelter. Post emergency phone numbers (fire, police, ambulance, etc.) by the phone. If a fire breaks out in your home, you may have only a few minutes to get out safely once the smoke alarm sounds. Everyone needs to know what to do and where to go if there is a fire. By taking the time to create an emergency supplies kit, your family will be prepared in the event of a disaster. The intensity of hurricanes that will hit land is measured in terms of categories that relate wind speeds and potential damage. Even less intense storms can cause damage in areas that have not prepared in advance. 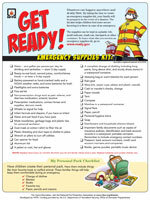 Sparky the Fire Dog® teaches kids about what needs to be included in an emergency supplies kit. Earthquakes Safety basics for earthquakes. Floods Precautions you should take in case of flooding. Hurricanes Ways to stay safe in a hurricane. Tornadoes Safety preparedness for tornadoes. Severe storms NFPA helps you prepare before a disaster strikes, and offers tips on what what to do during and after a storm.